Provides option for Participant Member Clubs to host sanctioned events as an independent “Event Organizer”. Requires participant club to complete membership contract that acknowledges that their coaches are independently certified and conform to coaching standards different to that of WushuOntario certified programming. Participant Clubs and their Individual Registered Members are NOT eligible for subsidies or support programs. Participant Member Clubs may apply to host events as an “Independent Event Organizer”. Provides Member Clubs access to utilize event and clinic subsidies to host events at their venue. Requires commitment to procedures as indicated in “Maintaining Membership Status” to be an ongoing member in good standing. WushuOntario is committed to helping Club owners offer the most efficient and professional programs to their members and as Full Member Clubs, the PSO supports offers it’s resources to aid in achieving these goals. Full Member Clubs are eligible to Host events as an official “Club Organizer”. WushuOntario is a designated Provincial Sports Organization recognized by the Ontario Government to oversee sanctioning protocol in combative sport pertaining to Sanda Free Fighting. 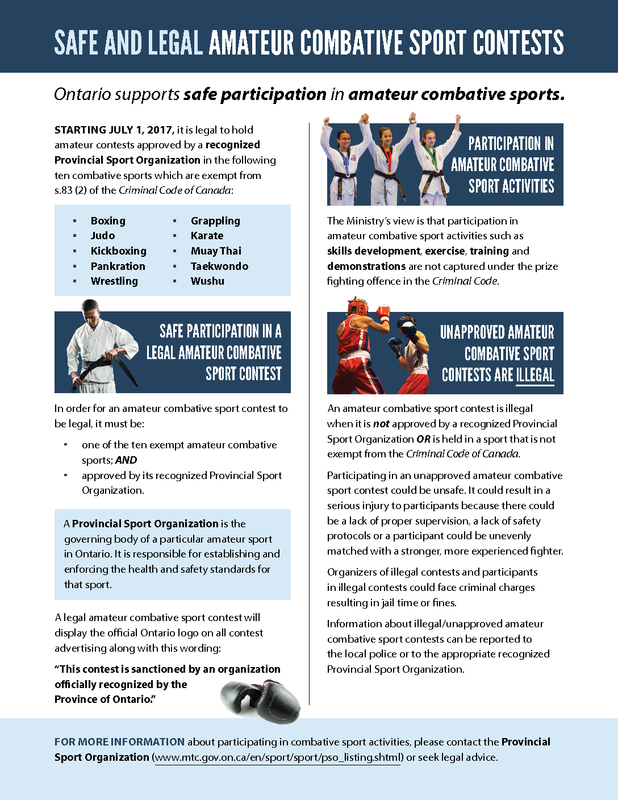 Ontario supports the safe participation in amateur combative sports. In 2015 the Ministry of Tourism, Culture and Sport released Game ON – The Ontario Government’s Sport Plan in which it committed to clarify the legal status of amateur combative sport. Through an Order in Council, the Government of Ontario has designated 11 amateur sports in which contests are now legal if held with the permission of a government-recognized Provincial Sport Organization (PSO). A PSO is a not-for-profit organization recognized by the Ministry as the governing body of a particular amateur sport in Ontario. The primary function of a PSO is the development of athletes, coaches and officials. A PSO must be recognized in accordance with the provincial Sport Recognition Policy. Currently there are 9 government-recognized PSOs in Ontario for combative sports. Contests in sports that are not sanctioned by a provincially-recognized PSO are deemed illegal. When sanctioning contests, PSOs must adhere to the definition of a contest and all requirements as detailed in the Sport Recognition Policy. If a contest meets the definition of a prize fight, it must be sanctioned by the recognized PSO. To host a contest in an exempt amateur combative sport, the associated recognized PSO must sanction the contest. The government has authorized nine PSOs as the recognized sport bodies to sanction contests. A contest NOT authorized by a recognized PSO in an exempt amateur combative sport could be deemed illegal and subject to prosecution. Contests in Amateur Mixed Martial Arts (AMMA) will remain illegal until the sport is added to the list of exempt sports and there is a recognized PSO for AMMA. Currently there is no international sport federation for the sport of AMMA that is endorsed by the Global Association of International Sport Federations (formerly Sport Accord) or the International Olympic Committee. Therefore, when the Order in Council (OIC) was created, the sport of AMMA was omitted from the list since there would be no organization designated to sanction amateur contests. Enforcement of the Canadian Criminal Code is handled by provincial or municipal police services. The Order in Council only applies to amateur combative sports contests that contravene the Federal Criminal Code and does not apply to participation in training or fitness activities. Before participating in an amateur combative sport, it is important to be informed about the health and safety practices at the training facilities or tournament venues. This includes obtaining information about first aid response and insurance policies that disclose how injuries are handled and the responsibilities of tournament or practice facility owners. To inform your decision about participating in an amateur combative sport, information about health and safety standards is available. For more information, please contact your Provincial Sport Organization, or email sport@ontario.ca to reach someone at the Ministry of Tourism, Culture and Sport.